Hybus is an innovative new hybrid bus project developed by Pininfarina and set to debut on Monday in the Piazza Duomo in Milan during MobilityTech, the two day international forum on technological innovation for the development of mobility and transport. With Hybus, Pininfarina is proposing a solution originally designed for the City of Turin, but exportable to any town sensitive to environmental protection. The project consists, in fact, in the conversion of buses powered by obsolete Euro 0-1-2 engines into serial hybrid. The model on display in Piazza Duomo is the first demonstration prototype, developed in collaboration with GTT with the aim of testing the technology and verify its industrial feasibility. The conversion into hybrid of an old bus with internal combustion engine has two advantages: reducing pollution of our cities and reducing costs and investments. Hybus, in fact, allows to save about 60% if compared with the purchase costs of a new hybrid bus. The revamping also solves the problem of wasting obsolete vehicles, since they can get back on the road with an up-to-date and eco-friendly small displacement diesel engine also boasting an environmentally friendly look. In particular, the original Diesel and automatic trasmission powerplant is replaced with a 1.3 liters Multi-jet Diesel power unit, meeting Euro 5 rules, with 69kW max. output, directly coupled to the electric generator, which provides energy to the main battery pack. Special electro-powered units give hydraulic and pneumatic services. The traction force to the original rear axle and drive-line is delivered by two Magneti Marelli electric motors mated to a collector-reduction gearbox. The lithium-ion battery pack and the Battery Management System are supplied by FAAM and the new powerplant and ancillaries management is integrated with the basic original electrical/electronic design. Thanks to the energy management software developed in collaboration with partners, Hybus recovers energy during braking. 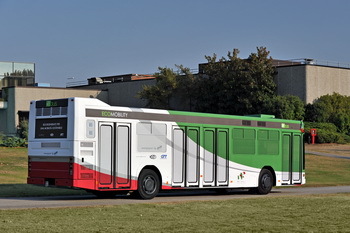 In terms of style, the bus retains its original form, albeit with the body repair work and the proposal of a new livery that incorporates the colors of the Italian flag to celebrate the 150th anniversary of the Unification of Italy. Inside, the most important intervention has been done on the rear area, suitably modified to allow the housing for the frame structure of the batteries. Even in the interiors graphics and colors, seats and covers have been revised. Hybus is part of the pioneering choice, made by Pininfarina a few years ago, to focus on sustainable mobility, declined in various forms: the adoption of full electric or hybrid powertrains for individual and collective transport vehicles, the research aimed at reducing fuel consumption and emissions, the use of alternative materials, lighter and more recyclable, active and passive safety, computerized traffic management. Hybus was developed in the Pininfarina's Design and Engineering Centre of Cambiano (Turin), which has already developed the Pininfarina BlueCar in collaboration with French group Bolloré, and the Nido laboratory, which has so far generated two projects: Nido EV, running electric prototype of a city car, which was also exhibited in Piazza Duomo at MobilityTech, and a Vehicle Demonstrator mechanized and electrified by Pininfarina for Auto Shanghai 2011, an ultra-efficient modular structure based on an aluminum space frame and use of composite materials, such as carbon fiber and aramid fiber honeycomb.